Life hands kids a lot of challenges straight from birth, but four-year-old Gavin Robert Stevens was doled out more than his fair share when he was born with Leber Congenital Amaurosis. The rare eye disease means that Gavin is essentially blind. 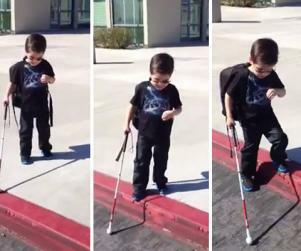 Gavin’s mother writes in the description of a video on YouTube that the youngster has been learning how to use his cane around the house for a few months now, and just recently, she recorded him taking his first steps off the sidewalk all by himself, for the very first time. You can tell he was unsure, yet, he is a lesson in bravery! He has been using his cane independently for a few months now, we have just been working on his steps/curbs/stairs with the cane. He had to talk his way through this, but he did not want any help! The encouraging words of a loving mother and Gavin’s triumph in banishing the fear from his mind as he hesitantly steps down the curb is enough to turn you into a big bowl of Jello pudding.